I’m kind of excited about this new program I found called Learn Math Fast. This series of books is good for two uses; it can be used as a review or remediation for an older student needing a crash course in elementary mathematics, or it can be used as an accelerated math program for advanced students. Bug, my oldest, falls in the second category. One of the biggest complaints parents of gifted kids have when it comes to elementary math is the incredible amount of waste, and the cost associated with a child who really doesn’t need a full math program. Often, mathy kids need a “quick and dirty” approach to math. They want to be taught the concept once, with no frills. They want to master the concept and move on. The Learn Math Fast System allows them to do just that- hit the big, important topics, so they can move on to more challenging, complex math. For this review, I was sent books 1-4, along with the Big, Big Bookmark and Geometry kit. Volume 1 starts with the very basics of Elementary Math. It covers everything from addition and subtraction, multiplication and division, multiplying and dividing decimals and fractions, and some measurement concepts- all in 49 lessons. Volume 2 covers fractions, percentages, and negative and positive numbers. Volume 3 covers basic Pre-Algebra: Solving for x, ratios, exponents, solving expressions, order of operations, distributive property, slopes and graphing. Volume 4 covers geometry: lines and angles, squares and polygons, Pythagoras, circles and the metric system. The Big, Big Bookmark and Geometry Kit: The bookmark is a full 8 x 10 plastic sheet which contains all the details, equations, and facts at a glance to help your children remember the details as they race through this program. It is broken down by book, so it’s easy to find the information you need. The Big, Big Bookmark reminds me of the “cheat sheets” my teachers used to let me make for high school math class. The Geometry kit comes in a pencil pouch and contains one inch foam square units, a protractor, a bouncy ball, a pencil, a formula card, laminated triangle examples, a fold out square foot of paper, a square and a rectangle, all for use with the fourth volume. The Learn Math Fast System is set up as a mastery program. Each lesson is meant to be read, and followed by a worksheet. At the end of a group of lessons, there is a chapter test, and a final test for the whole book’s contents. If your student misses two or more questions, you should not move on to the next section. The good news about this program is it is non-consumable. The worksheets are in the text itself, so you could complete them on a separate piece of paper, but the author has done you one better, and offers all of them as a free download to accompany the book (pass-code is given with the books). This means you can print off the worksheet, and if your child doesn’t get 100 percent, you can print off a fresh sheet tomorrow and try again. There are also supplemental worksheets (which you can access for free now!) if you need more practice on a concept. The system does move very fast, but it is done in a very clever way. The lessons themselves are written to the student themselves, in a conversational tone. Each concept is broken down into small, bite sized chunks and it taught in a clear step by step progression. I currently have Bug working in the second volume. 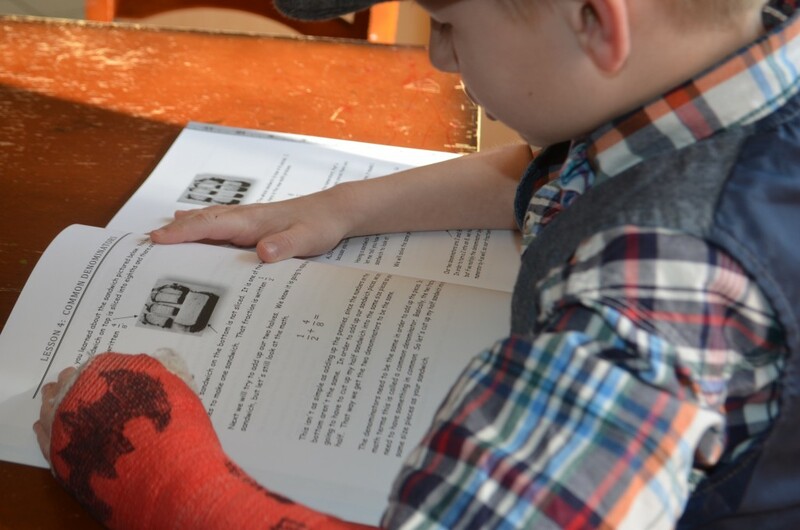 He really enjoys that the books contain black and white pictures were appropriate to help explain concepts (for example, they have images of a cut sandwich for fractions) and that the problems are clearly explained. 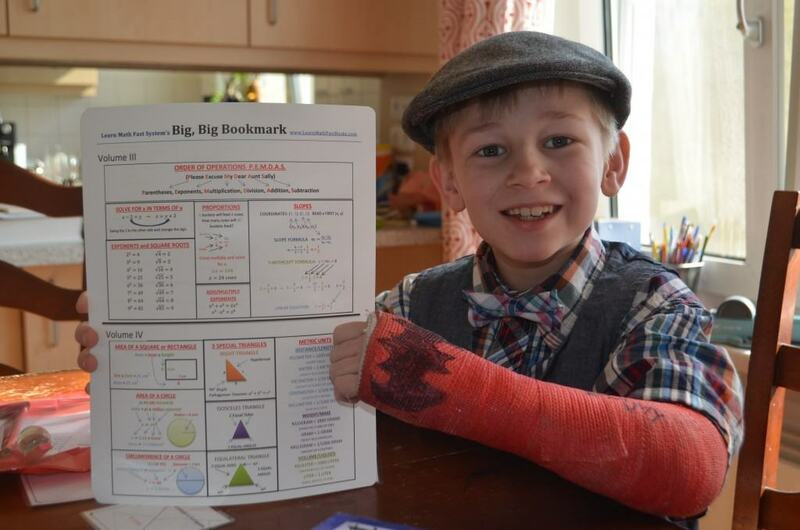 His favorite part is that the book is written to him, and he can work mostly independently. I like to sit near him so I can listen along to what he is reading in the book, and to support him if he struggles. He hasn’t struggled with the lessons though, I think because they are written so clearly. It’s really nice to have something for him to use and advance along in his studies without needing too much support or extra materials. These books are amazing for accelerating math, or for remediation. They are not, however, meant to be used as a full curriculum. I did try and use them with my younger son, who is just getting started with math. He has a solid understanding of numbers and basic arithmetic, and is an average first grader. While the content of the first book starts right where he is at, it’s too fast, and lacks the repetition needed for a younger student. It also does not include all math topics for all grades (I didn’t expect it to) so do remember that it’s a fantastic tool for the right student, but not a stand alone. This program is wonderful for our purposes. Bug is the right student for the program, and I am confident that Volumes 1-4 will prepare him well for the next step in his math education. How long the books will take really depends on how quickly your child masters the material- Bug is moving at a pace of one or two lessons a day, and could, in theory be done with Volumes 2-4 within a school year. I love that the books are non-consumable, so the one purchase can be used with all your students. Older remedial students can move even faster, and I think these books would be fantastic for bridging between classes in the summer, or helping keep material fresh throughout the year. 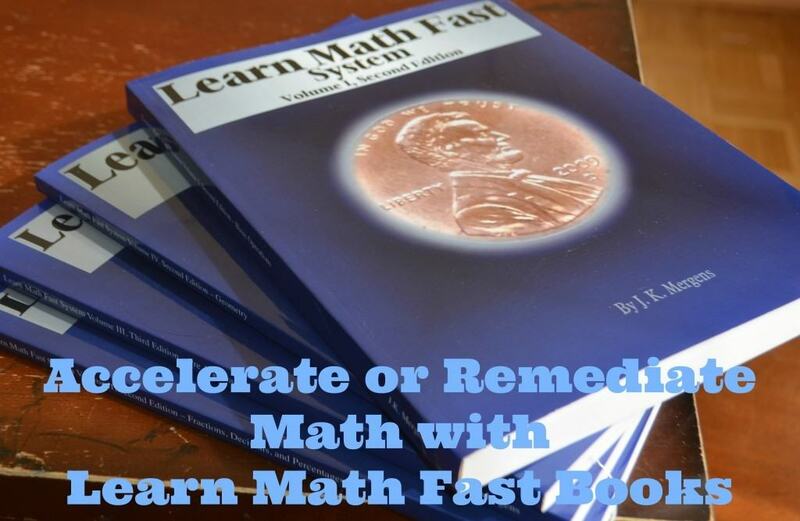 Learn Math Fast has offered one of their books to one lucky winner. You can choose any of the books in their store! I’m sure you can find one that will be of use in your Homeschool, so check out their offerings, and use the Raffle Copter below to enter to win. I will start with Volume 1. My 7-yo daughter could definitely use the review and learn some basic concepts. Thanks! I would choose volume 1 or 2. This looks like a great program! Thank you for sharing and for the opportunity to win! I would probably choose volume 1 and 2. This program looks great!b Thank you for the opportunity to win! Volume 2, it covers what my son is about to learn. I think 3 or 4. Volume 1 would be great. Vol 1 or 3 here too. This series sounds like a great overview! Thanks for sharing! I would either want volume one or 3… Tough choice! Of the four I have, volume 3 is my favorite. I love how simple they make pre-algebra! I’m not sure which I’d choose. I’ve been drooling over the math books for years. We can use all of them but if I won I’d probably choose the pre algebra.